There is a chill in the air, tree leaves are changing colour and pumpkin spice lattes will be in high demand again – which means that winter will be here before you know it. Some areas are already experiencing snow; don't put it off any longer; now is the perfect time to prepare your home for winter. 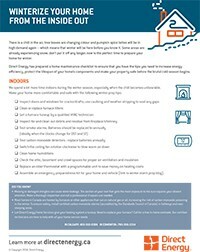 Direct Energy has prepared a home maintenance checklist to ensure that you have the tips you need to increase energy efficiency, protect the lifespan of your home's components and make your property safe before the brutal cold season begins. Missing or damaged shingles can cause water leakage. 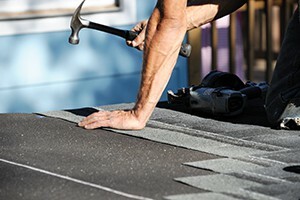 The section of your roof that gets the most exposure to the sun requires your closest attention. Make a thorough inspection and call a professional if repairs are needed. Most homes in Canada are heated by furnaces or other appliances that run on natural gas or oil, increasing the risk of carbon monoxide poisoning in the winter. 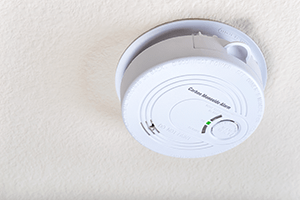 To ensure safety, install certified carbon monoxide alarms (accredited by the Standards Council of Canada) in hallways and near sleeping areas. 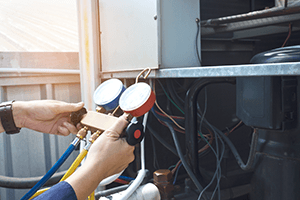 Let Direct Energy Home Services give your heating system a tuneup. Need to replace your furnace? Call for a free in-home estimate. Our certified technicians are here to help with all your home service needs.